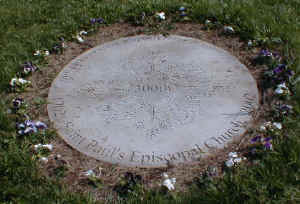 Marker commemorating St. Paul's 300th Anniversary in 2002 on the site of the original church in a part of the Old Swedish Cemetery. 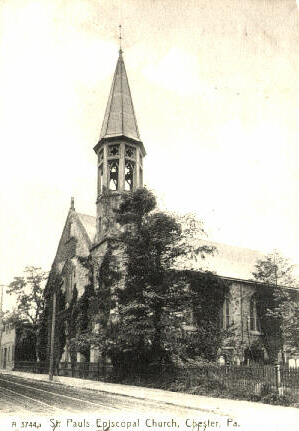 St. Paul's Episcopal Church, located since 1900 at the corner of 9th and Madison Streets, is actually in its third location since its founding on St. Paul's Day, January 25, 1702. The original building, containing 24 pews, was located in the heart of the city close to the Delaware River waterfront. We know that in January 1762 an advertisement appeared for a lottery for the purposes of funding the glebe and a dwelling house for the minister. St. Paul's was one of the original founding churches of the Diocese of Pennsylvania at a meeting held in Christ Church, Philadelphia, PA on May 24, 1785. The burying ground associated with St. Paul's preceded the erection of any church edifice by many years. The old graveyard on which the old church formerly stood was, in fact, a burying place belonging to the Swedes. We know that they had one on this site as early as 1684-5. The remains of this cemetery, now enclosed by a low brick wall, can be seen at the foot of the Avenue of the States between Front and 3rd streets. John Morton, PA Signer of the Declaration of Independence is interred there as are David and Grace Lloyd. The Lloyds were removed to St. Paul's after the Quaker Burying Ground on Edgmont Avenue between 6th & 7th streets was removed to make way for new retail construction in October 1959. 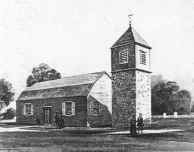 In 1835 extensive repairs were made to the original building, a belfry was added and the old detached belfry was torn down. Until the year 1850, St. Paul's and St. Martin's Episcopal churches (Marcus Hook, PA) shared the same ministers. In 1850 a new church building was erected on the north side of Third Street (northwest corner of 3rd & Welsh), and during the winter of 1872-73 the new church was altered and enlarged to a capacity of 750 persons. A new steeple and belfry were also built at that time. This second building was still standing in August 1952 but was razed in 1952 for a city parking lot. In August 1939 the old bell from St. Paul's was purchased by Sen. Sproul for his farm in Lapidea (now Sproul Estates, Nether Providence). A more detailed history of the early years of St. Paul's can be found in John Hill Martin's 1877 Chester (and its Vicinity), Delaware County in Pennsylvania with Genealogical Sketches of some old families, fully indexed by John A. Bullock III. � 2000, 2001, 2002, 2003, 2007 John A. Bullock III.